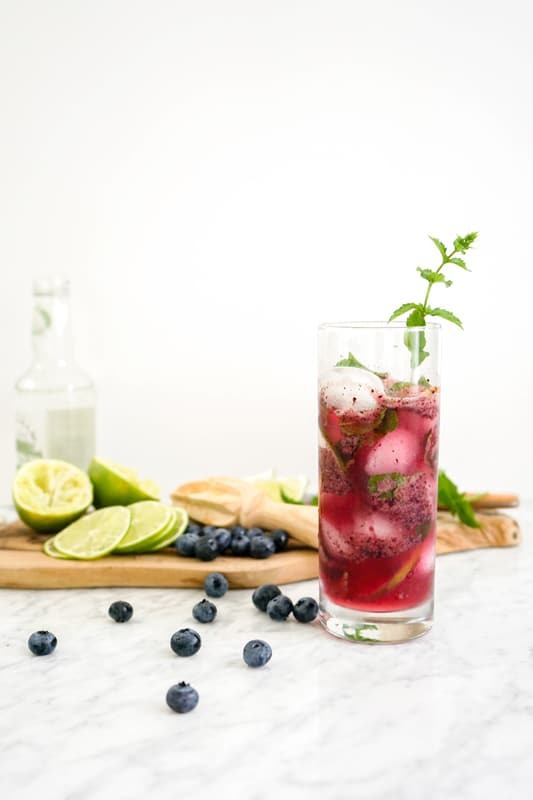 Home » Daily Living » Blueberry Kombucha Mojito – Healthy alcohol drinks? Yes! Even if you enjoy drinking alcoholic drinks in moderation, you can still make your drinks healthier! 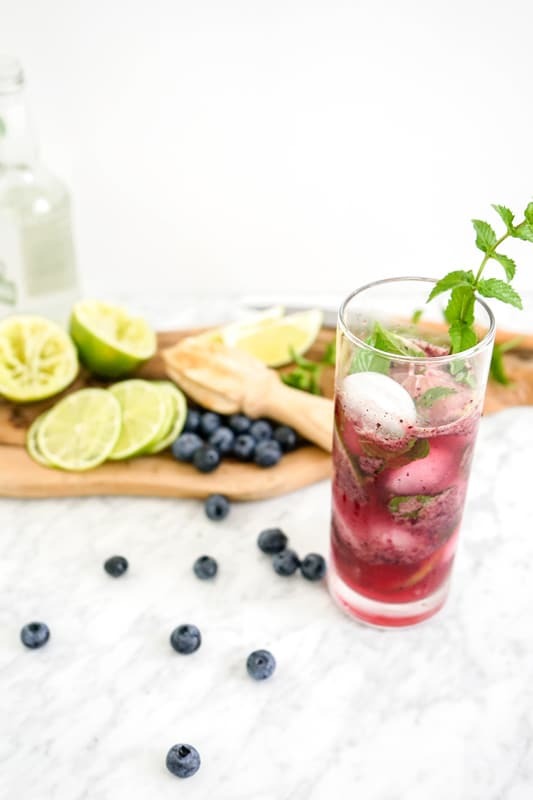 Talk about a perfect time for this Blueberry Kombucha Mojito, with summer season at full speed, why not make it a healthier patio season too! 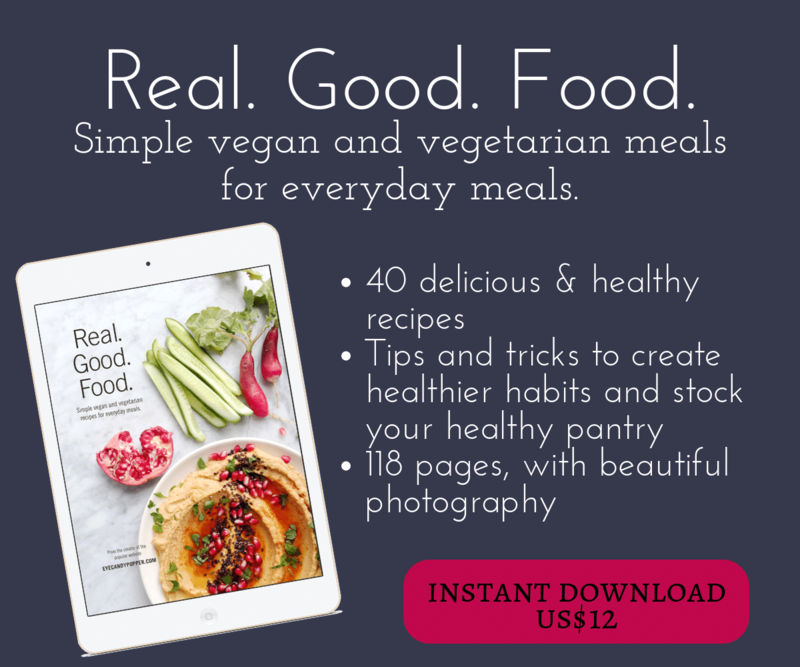 With just a few simple ingredients and using real flavours instead of pre-made drinks containing various chemicals, additives, and way too much refined sugar. This drink can be made with or without alcohol. You can also customize this drink with whatever fruit is in season where you are. Why should you care about the health benefits of your drinks? Well, for one reason, it’s too easy to drink bad ingredients that provide nothing good for our bodies. Also, despite not worrying about calories that we eat, we should pay attention to calories that we drink. Because it’s such a simple process to drink something instead of chewing it, many people consume an extraordinary amount of empty calories, additives, and an enormous amount of refined sugar, simply because they drink it instead of eating it. Because it’s in liquid form, our bodies absorb these even faster and can create havoc on our blood glucose levels, which can create short and long term health issues. 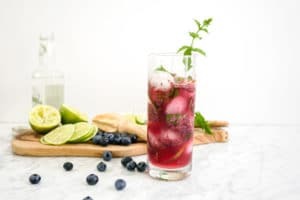 There are many companies that make organic alcohol now as well, so that is a great option to have and help reduce your exposure to chemicals even more. You can watch this really cool video from Ask Men and Rise, talking about Kombucha and how delicious it can be in a mixer. Yum!!! Oh the delicious flavours of summer! Say goodbye to unhealthy drink mixes full of additives and sugars, and hello to real fruit flavours and gut-healthy kombucha! Mix all ingredients in a blender with some ice and pulse until smooth. Divide in 4 large glasses with ice cubes, top with a good quality natural tonic water, and serve. Delicious! 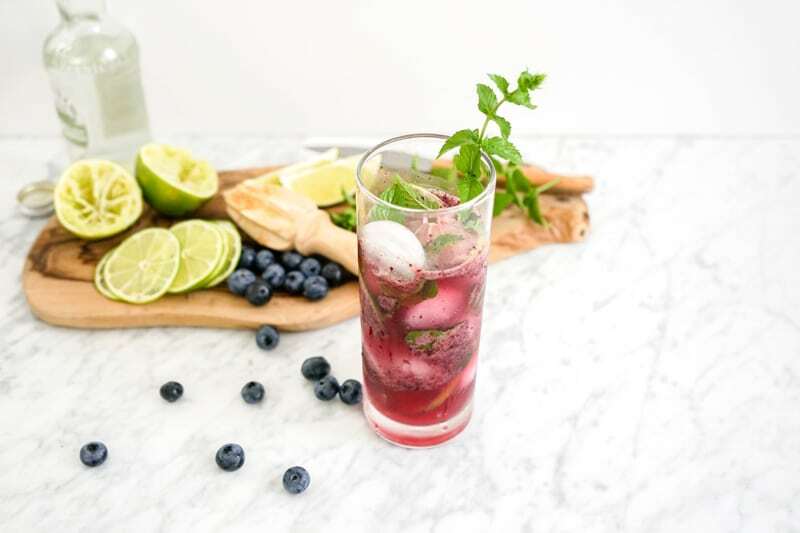 You can add extra mint leaves and lime slices, for garnish in each glass. Love this cocktail, Gabby! I wasn’t aware that you published cocktail recipes — I’ll be sure to keep my eyes peeled for them now. I too am a fan of better-for-you cocktails and can’t stand pre-mixed drinks. Cheers! I don’t drink much, so I rarely create new drink recipes, but this is a delicious one! It tastes so much better, doesn’t it?! Love it, the maple syrup gives it just the right sweetness! Yes, it does! Glad you liked it! PS: I would love to learn your photography ways! Awesome stuff, Girl! Thank you so much! 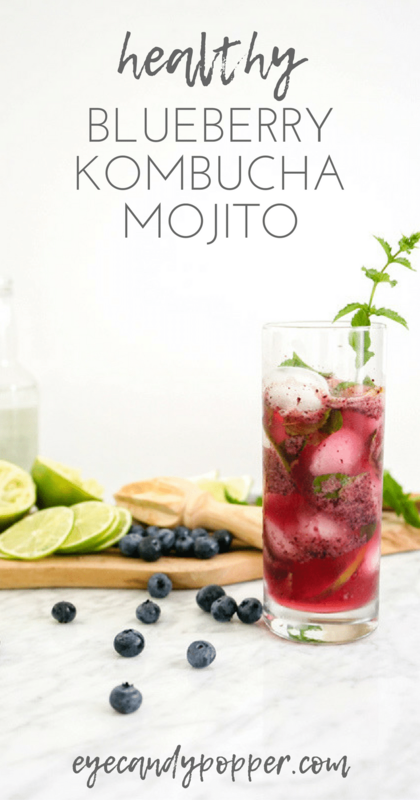 I’m the same as you, I don’t drink alcohol often, but I love the freshness of Mojitos, and this one is SO good, plus, the alcohol is totally optional. Fruity, fizzy, and fun! I’m a big fan of kombucha and artisan spirits. This mojito looks so tasty! It is scary the amount of sugar that can be hidden in drinks! I like my kombucha, and I love all of the fruit you’ve added to this! I love kombucha, but never would have thought to use it in a cocktail. This one looks beautiful and sounds delicious. I’ve yet to actually buy or make kombucha. Don’t get me wrong, I’ve had it (mainly in the form of tasters and free samples), but I have yet to actually commit to drinking it in any quantity, which is odd really, as I’ve enjoyed what I’ve had. But I must say, it sounds like a really interesting way to not only create a healthier cocktail, but to make a cocktail with a unique flavour profile and distinctive character. I’m really big on my cocktails and alcoholic beverages being memorable and unique, as I feel they (like desserts) are best when they’re consumed in small quantities, leaving lasting memories. So thanks for giving me something wonderful to think about – and hopefully to try! Cheers. Thanks Sean! I really hope you do “commit” to Kombucha, although I will warn you that every kombucha is different, just like a micro-brewery, every brand has their own distinctive taste and flavours. If you don’t like one, try another. You can also make your own fairly easily. Kombucha adds a unique flavour to cocktails, similar to a shrub in some ways. Have you ever made kombucha, I’m wondering what the difficulty level would be? I have! As long as you have the “Scoby”, it’s ultra-easy (basically adding a strong tea (cooled down) and sugar to feed the fungi that creates kombucha. However you require patience, since it takes about 2 weeks to make 1 big batch.If you want you kombucha fizzy, it also requires 1 last step at the end.But it’s really not complicated at all and the cost is very cheap, just black tea and sugar. Dude, you had me at healthy and alcohol. I’m new to drinking Kombucha. The more I drink the more I like it! Right now I’m stuck on this strawberry flavored one that I buy almost every week. 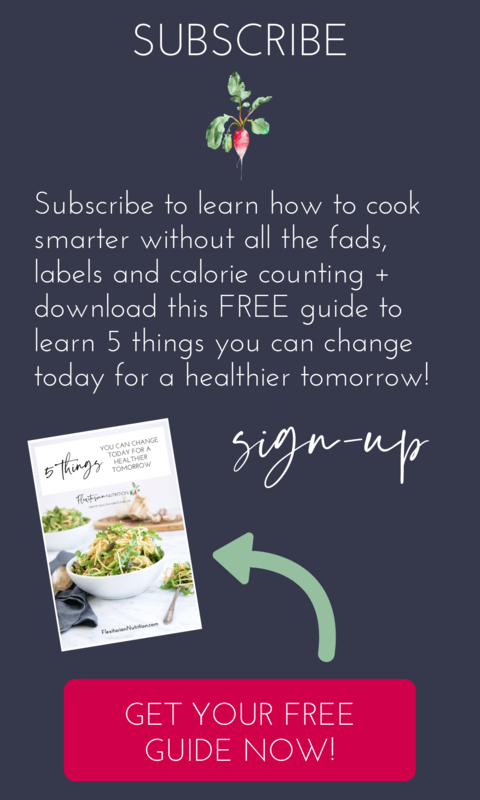 I’m stoked to try ginger Kombucha so I can try this recipe, which looks amazing! I adore the photography too. The white background really makes the drink pop!